A preserved town center with a number of religious monuments makes Bui a worthwhile destination for a short visit. 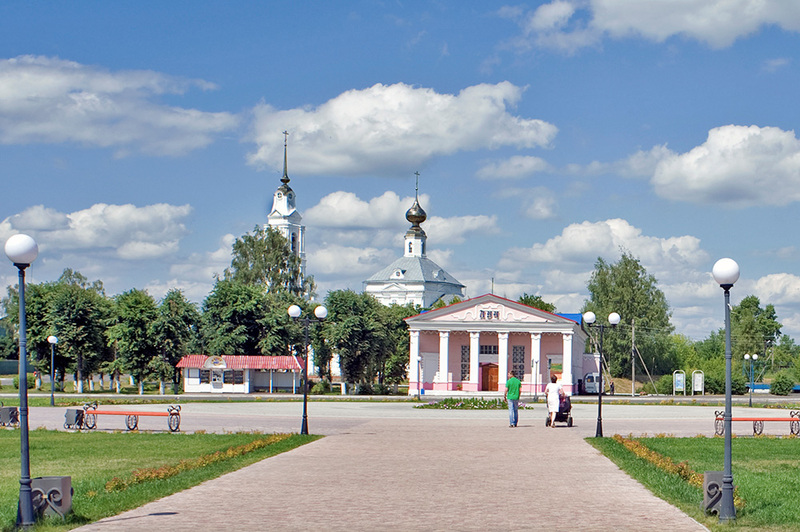 The Kostroma Region has a wealth of small historic towns, each with a distinctive setting and cultural heritage. Among these is the town of Bui (pronounced like “buoy”), located on the right bank of the Kostroma River some 60 miles north of the city of Kostroma. With a population around 24,000, Bui is among the larger of the region’s historic towns — a status owed primarily to its development as a rail hub during the 20th century. The town’s origins date to the beginning of 1536, when settlers in the area sent a request to Moscow for a fortified point on the northeastern fringes of the Muscovite state, a territory vulnerable to raids by Kazan Tatars and their allies. The petition was addressed to the five-year-old Grand Prince Ivan IV (who was subsequently known as Ivan the Terrible) and to his mother, Elena Glinskaya, who served as Muscovite regent following the death of her husband, Basil III, in 1533, until her own untimely death (perhaps from poison) in 1538. With the creation of the Bui fort, surrounding settlements could raise the alarm as raiders approached in barges along the Kostroma River, an important left tributary of the Volga. When a threat was detected, signal fires alerted sentries at the Bui fort, whose church bells summoned local defenders. Peasant families made their way to a drawbridge and into the fort, bounded on two sides by the Kostroma and Vyoksa Rivers, and on the third side by a moat. Behind the stout log walls, families were protected from slave raids that were an especially pernicious scourge. Ivan the Terrible’s conquest of the Tatar khanate of Kazan in 1552 greatly reduced the military significance of the Bui fort. During the 16th century, the settlement spread to both sides of the Kostroma River and beyond the small Vyoksa River. By the end of that century, Bui had six log churches. The primary church, located in the fortress, was dedicated to the Annunciation. Overlooking the market square was the Church of St. Paraskeva-Pyatnitsa, patroness of trade, while the other side of the Kostroma was graced by the Church of the Resurrection. During the turbulent reign of Boris Godunov (1598-1605), Bui served as a place of harsh exile. Indeed, more than a decade before he came to power, Godunov exiled to Bui those considered rivals to his power as de factor regent of Muscovy after the death of Ivan the Terrible in 1584. The most prominent exile was Prince Andrei Ivanovich Shuisky, uncle to Tsar Vasily Shuisky, who ruled from 1606-1610. Take the direct train from Moscow to Bui (Yaroslavsky Railway Station; departure at 1:50 p.m. and 11:05 p.m. every day; travel time 7.5 hours). Largely spared the devastation of the early 17th-century dynastic crisis known as the Time of Troubles, Bui gradually expanded as a regional administrative center. Although afflicted by an attack of plague in 1654, the settlement was spared the worst when the onset of severe cold in late October suppressed the spread of the disease. Grateful inhabitants rebuilt the Church of St. Paraskeva and began an annual procession of the cross, which is held on Oct. 28. Until 1775, power in the town was delegated to a voevoda, who was responsible for maintaining order. In 1778, Catherine the Great granted Bui the status of a regional administrative center and gave it a rudimentary town plan. At the same time, Bui received its official coat of arms, which in fact depicts a buoy — no doubt in recognition of its place on the Kostroma River. Although there is no consensus on the derivation of the town’s name, it is unlikely to have derived from the word “buoy” in the 16th century. Catherine’s heir, Emperor Paul, revoked the town’s status in 1796 because of its weak growth. Fortunately for the town’s continued existence, Alexander I restored Bui to its status as a regional administrative center in 1802. By the middle of the 19th century, Bui had slightly over 2,000 inhabitants. As with all such towns, the center of Bui was dominated by its churches. The foremost among them was the Church of the Annunciation, rebuilt in brick in 1810 at its original location near the confluence of the Kostroma and Vyoksa Rivers. In 1812, Emperor Alexander gave the lavish sum of 1,000 rubles for the decoration of the interior. Constructed in an austere mixture of baroque and neoclassical styles, the two-story church had a particularly imposing bell tower. Its main altar was on the upper level, while the ground floor had an additional three altars dedicated to St. Nicholas, St. Paraskeva and the Smolensk Icon of the Virgin. During the 1930s, the closed church was ransacked and converted to use as a bakery. It is now being gradually restored beginning with the lower altars. Also restored is the Church of the Resurrection, picturesquely situated just across the Kostroma River. Built in 1835 within a cemetery, the Resurrection Church has a refined neoclassical bell tower attached to the west of its simple, archaic main structure. In addition to the main altar, the church’s vestibule on the west side has two secondary altars dedicated to St. Nicholas and the Kazan Icon of the Virgin. The one-story vestibule could be more easily heated, and in typical Russian practice, the secondary altars were used for worship in the winter. The third surviving religious monument in the center of Bui is the rotunda Chapel of St. Paraskeva, a recreation in 2000 of the demolished neoclassical chapel erected in 1833 on the site of the earlier Church of St. Paraskeva. The final Orthodox monument in Bui is the Church of St. Nicholas, completed in 1913 as an attachment to the recently built railway station. The Russo-Byzantine style church survived the Soviet period and has now been beautifully restored. This landmark gladdens the sight of thousands of rail passengers that each month pass by the Bui railway station from places as distant as Vladivostok—almost six days by rail from Bui. Indeed, railroad construction transformed Bui in the 20th century. At the end of the 19th century, the town’s major industry, in addition to timber processing, was a vodka distillery, whose some 40 workers were paid primarily with pails of vodka. The soft water of the nearby marshes was considered a great advantage for producing the subtle tastes of the spirit. At the beginning of the 20th century, however, work began on a rail line from St. Petersburg through Vologda to Vyatka and on to Siberia. By 1905, rail traffic had commenced on the Bui section of this north line of the TransSiberian railway. At the same time, construction began on a branch to Danilov, situated on the mainline between Yaroslavl and Arkhangelsk. Thus, within a few years Bui had gained direct access to both St. Petersburg and Moscow (through Yaroslavl). Its festively decorated, expansive station opened in the fall of 1905. Railroad development accelerated during the early Soviet period. The investment was amply justified during the Great Patriotic War, as World War II is called in Russia. During the war, the Bui rail junction played a vital role, funneling supplies and troops from the eastern territories of the Soviet Union over the Kostroma River to the colossal battlefields. Contemporary Bui has been fortunate in preserving much of its historic center, an attractive prerevolutionary environment of two-story commercial and administrative buildings interspersed with brick and wooden houses. One of the merchant houses has been converted to an excellent local history museum. Even the Soviet structures in this central district managed to preserve the scale and something of the style of an earlier era. For all its modest size Bui represents some of the most charming features of Russia’s provincial ambience.